A midsummer treat for all us movie geeks! 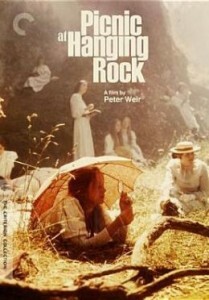 The wonderful Criterion Collection has done it again, this time with one of my all-time favorite films–Peter Weir’s gorgeous 1975 masterpiece, PICNIC AT HANGING ROCK. I’ve already reviewed this film in my blog, and you can read my original recommendation here. But now the Criterion people have done a new, upgraded package of the film, including newly remastered copies in DVD and Blu-Ray and a third disc of extras. There’s a 1975 on-set doc about the making of the film, interviews with Weir and several cast members, the original theatrical trailer, and comments from several prominent critics and film historians. Also included is a brand-new reprint paperback of Joan Lindsay’s long-out-of-print novel!!! Yes, the book that started it all is bundled with the 3 discs. So this is what we call a double-geek package–it appeals to film geeks AND book geeks!!! I fall into both categories, of course, and maybe you do, too. I highly recommend Lindsay’s book–it’s a fine example of a genuine “mystery.” (And we’re not talking Agatha Christie here!) The paperback is all the more reason to grab this deluxe edition from Criterion while it’s available. I’m geeking out! Enjoy! This entry was posted in Books, Classics, Movies, Recommendations by Tom Savage. Bookmark the permalink.